Revisions to the decades-old embargoes between the United States and Cuba are now scheduled to go into effect this Friday, implementing major changes this week to the long-standing trade and travel restrictions between neighboring nations. New policies, announced by the Obama administration on Thursday this week, are expected to allow American travelers contained in 12 categories to travel to Cuba without applying for specialized licenses, alleviating restrictions that have largely excluded the US public from the island for more than 50 years. In addition to easing travel restrictions, The Hill reported that the changes from the Departments of Treasury and Commerce will allow travelers to bring back to the US upwards of $400 worth of goods, including $100 in alcohol and tobacco products, such as Cuban cigars. With regards to the 12 categories of persons now authorized to travel to Cuba, the Treasury said that Americans will be able to do as much if the trip constitutes family visits; official business of the US government, foreign governments and certain intergovernmental organizations; journalistic activity; professional research and professional meetings; educational activities; religious activities; public performances, clinics, workshops, athletic and other competitions and exhibitions; support for the Cuban people; humanitarian projects; activities of private foundations or research or educational institutes; exportation, importation or transmission of information or information materials; and certain authorized export transactions. News of the changes came less than one month after US President Barack Obama announced an end to what he called “an outdated approach that for decades has failed to advance our interest.”“Today’s announcement takes us one step closer to replacing out of date policies that were not working and puts in place a policy that helps promote political and economic freedom for the Cuban people,” Timothy Lew, the secretary of the US Treasury, said in a statement on Thursday. Earlier this week, Cuba released 53 political prisoners as part of last month’s deal between Havana and Washington. 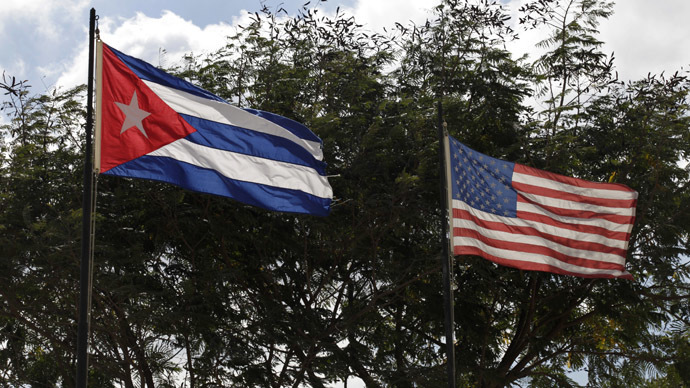 After over 50 years of failed interactions, the new US-Cuba ties offer American companies "extraordinary opportunities," Chamber president and chief executive Thomas Donohue said, AFP reported.